It’s 2:30 p.m. at Lincoln Park Elementary School in Portland, Oregon. For the third-graders in Molly Bennison’s class, that means it’s time to move. “The afternoons can get really long, and these students just need to move around,” says Bennison. 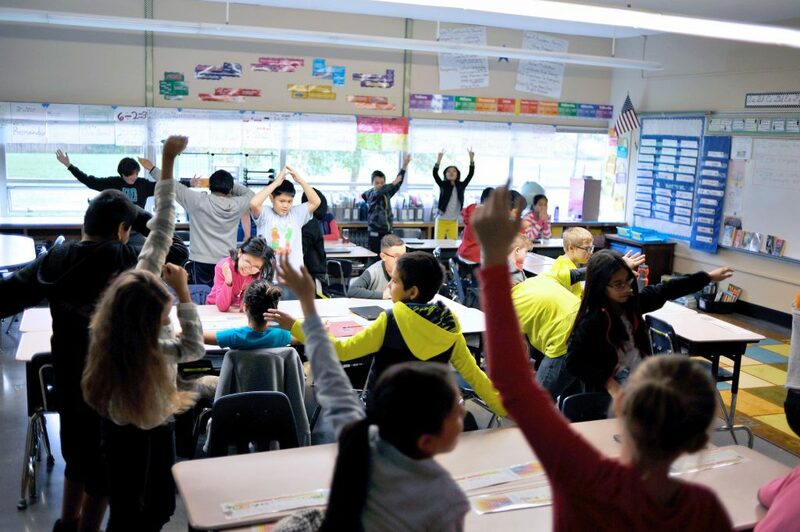 For the 29 third-graders in her class, the daily “movement break” consists of 10 minutes of quick recess outside, or more likely (because of Portland’s rainy weather) a structured game in the classroom. One of the class’s favorites is Four Corners, where students move to different corners of the room while a classmate in the middle closes her eyes and counts to 10. Over the last two years, movement breaks have become a day-to-day ritual for all students at Lincoln Park. 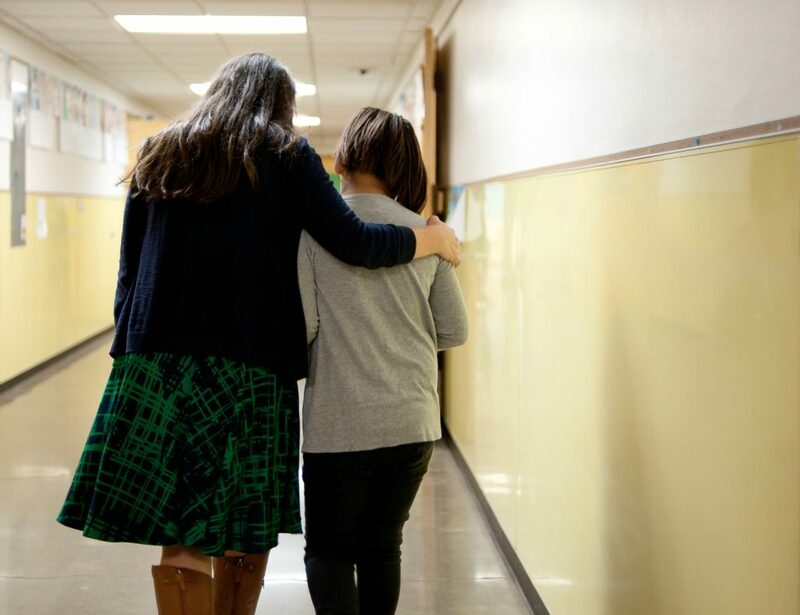 The breaks are part of a broader effort under way in Portland and surrounding Multnomah County to tackle a persistent barrier to better educational outcomes: too many students are taken out of the classroom and sent to the principal’s office because of behavioral issues. These “disciplinary referrals” put boys and students of color at disproportionately high risk of getting suspended or expelled, and ultimately dropping out of school. Since Lincoln Park’s school-wide adoption of movement breaks in the 2016-17 school year, disciplinary referrals are down 46 percent, with equal improvement for both boys and girls. In a building where students speak 23 languages and where white students are less than 40 percent of the student body, the school also saw reductions in referrals across all racial and ethnic groups. All of that changed when All Hands Raised, the local cradle-to-career partnership, began working with a team from Lincoln Park to explore the root causes of disproportionate discipline and to find the practices that would lead to improvement. 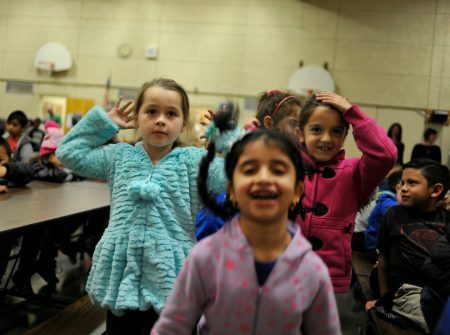 The work is part of a wide-ranging effort launched by All Hands Raised to address disparities in educational outcomes across seven school districts in Multnomah County. With encouragement and support from All Hands Raised, each of the districts developed policies aimed at addressing racial inequities in school discipline. All Hands Raised also works directly with site teams at schools across the seven districts to tackle issues from racial equity and kindergarten readiness to postsecondary access. 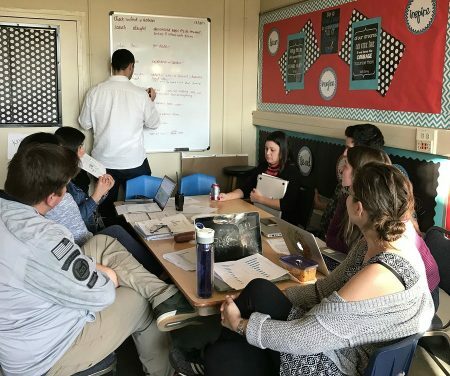 Lincoln Park is one of seven site teams working on improving disproportionate discipline, with the goal of keeping all students in the classroom and ensuring that they are engaged and learning. The site team at Lincoln Park Elementary includes school staff alongside a representative of a local nonprofit that works closely with immigrant and refugee populations. In their early conversations with All Hands Raised, team members reviewed disaggregated data and identified a pronounced disparity in referrals for boys in comparison to girls. They talked about how a lack of movement and physical activity might contribute to behavioral problems for boys. The team subsequently decided to set aside 10 minutes of classroom time every day for movement breaks starting in the 2016-17 school year. Before long, teachers were experimenting with everything from in-class yoga and tai chi to short walks outside to games and activities suggested by GoNoodle and similar resources. For 2017-18, the school couldn’t alter the bell schedule (as it had done in the prior year) to set aside 10 minutes of dedicated time for movement breaks because of transportation schedules, but educators in the building were hooked. Now, teachers build time into their daily class schedules for the breaks, and they use their regular faculty meetings to share ideas for fun activities and games. “Teachers can see the benefit of this in their classrooms every day. They are gaining more time to be able to teach because students are ready and can focus,” says Lincoln Park Principal Ceci De Valdenebro. The movement breaks are not the only change Lincoln Park has made to address behavioral and disciplinary issues. Another strategy that became a priority in 2017-18 is adopting a more proactive stance toward communication with parents and families. De Valdenebro points out that teachers traditionally are in direct contact with parents only after a child is facing behavioral or performance issues. A better approach, she says, is to establish a relationship with the parent or guardians before issues arise. Administrators and teachers at Lincoln Park are exploring the use of various communication apps that will allow teachers to stay in more regular contact with parents, without creating a burden. (Among the apps that various teachers are trying: Remind, ClassDojo and Bloomz.) De Valdenebro says she hopes they have a system in place for “unifying two-way communications” with parents by the 2018-19 school year. All Hands Raised hopes that movement breaks and other proven interventions for reducing disciplinary referrals become standard practice across the seven school districts in Multnomah County. Twice a year, the partnership convenes and facilitates professional development gatherings of all of the school community sites working to address disciplinary issues across the county’s districts. All Hands Raised also is working closely with the team at Lincoln Park to capture and document results so they can more easily share this approach with others. “What this is really about is supporting people to see that they have the tools and the resources right now to make important changes that are going to pay off for kids,” says Baldizon, who serves as associate director with the partnership. All Hands Raised has been a “fantastic partner” in the school’s work, Snyder says. As a member of the site team working on discipline, she says she looks forward to the group’s monthly gatherings. “It really feels like we are getting something done, and I leave those meetings refreshed,” she says. What Changed in Portland/Multnomah County, Oregon? In one year, behavior referrals at Lincoln Park were down 46 percent, with equal improvement for boys and girls. Movement breaks have caught on with teachers and students alike as a way to keep classrooms focused and fun. Now, All Hands Raised is supporting Lincoln Park to share its successes with other schools across Multnomah County. Discipline is an equity issue. Across the nation, African American students are suspended or expelled at a rate three times greater than white students are. Also at higher risk: American Indian and Native Alaskan students and students with disabilities. Reducing these disparities can be a critical step to achieving educational equity. Schools and communities need space and support to shape solutions. Lincoln Park Elementary School had a principal and staff members who knew that disciplinary referrals were a problem. They just needed the focus and support to come up with proactive solutions that worked for them. With All Hands Raised organizing and facilitating site team meetings, the school and its community partners are achieving real, meaningful progress. It doesn’t have to be complicated. Movement breaks are a simple idea. By supporting teachers to add them to their classroom schedules and to share good ideas, Lincoln Park gave them an easy (and fun!) way to advance educational equity and improve the environment for learning. A teacher survey revealed a steady commitment to the breaks over the previous and current school year. One hundred percent of teachers are implementing the breaks with consistency. This is critical since the building experienced the change in principal and the loss of the mandated 10 minutes of time this year over last. Teachers being integrated into the school community site teams, and contributing their voices in the decision making, creates the culture change necessary for this work to “stick” in a building. Nothing spurs attention — and action — like success. 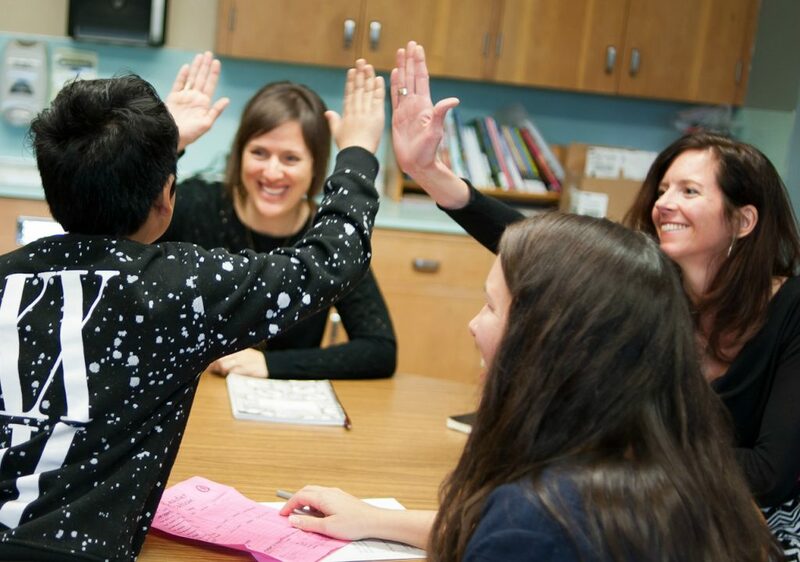 At Lincoln Park Elementary, movement breaks caught on as a successful approach after teachers started to share stories of what was working in their classrooms. Now, All Hands Raised is supporting the school’s administrators and staff to communicate their successes and their enthusiasm to others across the county.